The National Assembly Thursday voted (98 in favor, none against) to approve supplementary budgetary spending authority to the maximum amount of 900 million leva on the executive budget for the account of the overperformance of revenues for 2007, BTA reports. 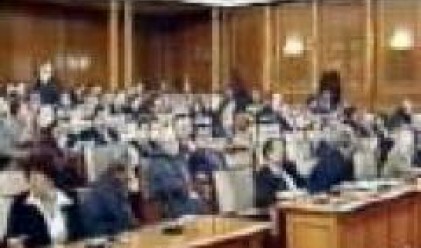 When the resolution, moved by the Council of Ministers, was put to the vote,the opposition MPs walked out of the debating chamber. The Government requested that up to 570 million leva of the 3,500 million leva budget surplus be approved for spending, and Economic Policy Committee Chairman Yordan Tsonev MP of the Movement for Rights and Freedoms proposed that the amount be up to 900 million leva. The money will be allocated to construction of road, rail and environmental infrastructure, as well as to Sofia's underground railway. The resources will also be spent on honouring commitments assumed under the Energy and Telecommunications chapters of Bulgaria's EU Accession Treaty, as well as on short-term interest-free loans from the central-government budget for financing municipalities' expenditures, including value added tax, on approved projects and programs co-financed by the EU. By May 31, 2008, the Finance Minister will transfer the surplus under the consolidated fiscal programme, reported at the end of 2007, in excess of 3 per cent of GDP to the State Fund guaranteeing the sustainability of the public pension system. A motion by Antonela Poneva MP of the right-wing opposition Democrats for Strong Bulgaria (DSB) that one extra monthly wage in the public-financed sector and one extra average pension to each pensioner be paid from the budget surplus was defeated, 45-46 and 49 abstentions. "Over the last 24 hours, the ruling majority set up a slush fund of its own amounting to 1,200 million leva," DSB Deputy Floor Leader Vesselin Metodiev told journalists in Parliament. For her part, Antonela Poneva said that the surplus "must be appropriated, not misappropriated as the ruling majority are doing on." Yordan Tsonev told the media that this is the first time that the National Assembly has approved the spending of resources from the budget surplus, as this has been done so far by the Council of Ministers. He added that Thursday's resolution specifies the areas in which the money will be spent: roads, railways, energy projects etc. He argued that the transparency of spending the budget surplus is ensured by the state budget implementation reports and by the checks of the National Audit Office. Deputy Finance Minister Lyubomir Datsov said that the bulk of the surplus goes mainly for roads, infrastructure, environmental protection and purchase of fuel. Datsov explained that the responsibility for the proper spending of the funds rests with the individual ministries, while the Finance Ministry is responsible only for the total cash flow. "The budgets of the separate ministers are audited by the National Audit Office and other control authorities," he noted.